Still in Love with You is unlike anything ever written about Hank and Audrey Williams. 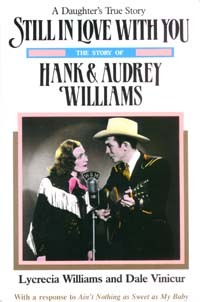 For the first time someone who knew both of them intimately has opened their lives so that the real Hank and Audrey Williams can be known. In this touching story, their daughter recounts the previously untold truth of their lives, interprets it in light of what is known today about alcoholism and co-dependency, and with tenderness and humor shares the love that Hank and Audrey had for each other. Hank and Audrey Williams had it all, or so it seemed. Rising from poverty in rural Alabama, almost overnight they achieved great wealth and fame. In Hank's brief but spectacular career as the greatest star country music and Nashville's "Grand Ole Opry" have ever known, he wrote and recorded some of popular music's most enduring classics, such as "Your Cheatin' Heart," "Jambalaya," and "I Can't Help It (If I'm Still in Love with You)." And then it all fell apart. Audrey had been the driving force behind Hank's success and the inspiration for many of his songs. When his alcoholism ended their marriage in early 1952, his life quickly descended into extended bouts of drunkenness and sickness. On January 1, 1953, he died in the back seat of his blue Cadillac convertible on the way to a concert in Canton, Ohio, a victim of alcoholism and medication. He was twenty-nine years old. Nearly twenty-three years later, Audrey also died as an alcoholic, but not before becoming a legend herself and masterminding the career of their son, Hank Williams, Jr. Today Hank and Audrey are buried side by side in Montgomery, Alabama. Still in Love with You corrects errors long accepted as true and undoes the often unkind characterizations found in other works. Because Lycrecia is often asked about the "Jett Williams issue," it also includes a personal response to Jett's autobiography Ain't Nothing as Sweet as My Baby. Containing stories that have never before appeared in print, Still in Love With You re-introduces Hank and Audrey Williams they were, with all their flaws and beauty.